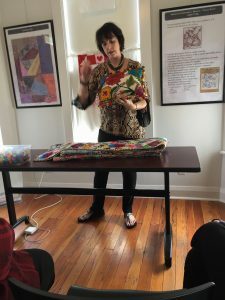 Three times this weekend Sharon Wasteney, Charlotte McDonnell and I gave a trunk show/lecture on design, fabric dyeing and painting and GELLI printing. All three were well attended which lets me know that we are not the only quilt rebels around! Very successful and fun event. 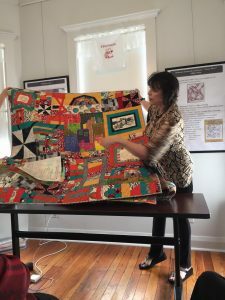 Thank you to everyone involved from Friends of the Aransas County History Center and Piecemakers By The Bay Quilt Guild. Wonderful programs given throughout the time the exhibit displayed. Very interesting programs everyone enjoyed. 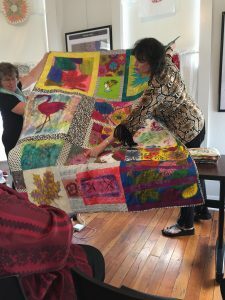 The History Center has enjoyed collaborating with such a terrific, dedicated group, Piecemakers by the Bay Quilting Guild. Thank you for everyone’s participation.